YaRrr! 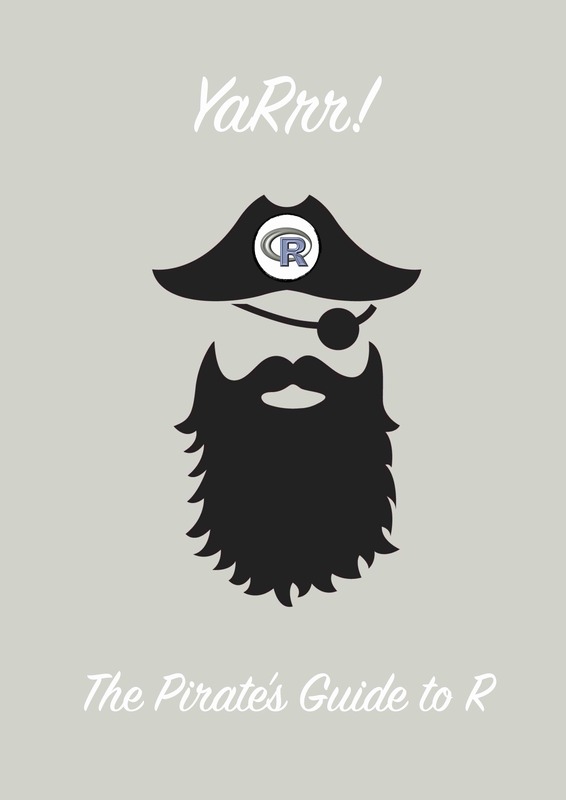 The Pirate’s Guide to R, is an introductory e-book to the R programming language written for people with little to no programming experience. This whole story started in the summer of 2015. I was taking a late night swim on the Bodensee in Konstanz and saw a rusty object sticking out of the water. Upon digging it out, I realised it was an ancient usb-stick with the word YaRrr inscribed on the side. Intrigued, I brought it home and plugged it into my laptop. Inside the stick, I found a single pdf file written entirely in pirate. After watching several pirate movies (ok, maybe just the Goonies 10,000 times), I learned enough pirate to begin translating the text to English. Sure enough, the book turned out to be an introduction to R called YaRrr! The Pirate’s Guide to R.
This book clearly has both massive historical and pedagogical significance. Most importantly, it turns out that pirates were programming in R well before the earliest known advent of computers. Of slightly less significance is that the book has turned out to be a surprisingly up-to-date and approachable introductory text to R. For both of these reasons, I felt it was my duty to share the book with the world. I originally wrote the book in LaTeX for a traditional PDF output. This version works great for printing. However, it is difficult to update, and cannot be easily displayed online. For these reasons, I am in the process of converting the book to a web-friendly, HTML format using the fantastic Bookdown package. This version will continually be updated whie the original LaTeX version will (most likely) not. Support YaRrr! with a donation! I am a huge proponent of open source software (like R) and open science. So a version of this book will always be freely available! That said translating and updating the book takes quite a bit of time. So if you like the book, and want to see it get even better with more pirate-speak and terrible jokes, consider throwing some gold my way by clicking the donation button or go to paypal.me/ThePiratesGuideToR!